Neurons from the adult central nervous system (CNS) demonstrate limited mRNA transport and localized protein synthesis versus developing neurons, correlating with lower regenerative capacity. We found that deimination (posttranslational conversion of protein-bound arginine into citrulline) undergoes upregulation during early neuronal development while declining to a low basal level in adults. This modification is associated with neuronal arborization from amphibians to mammals. The mRNA-binding proteins (ANP32a, REF), deiminated in neurons, have been implicated in local protein synthesis. 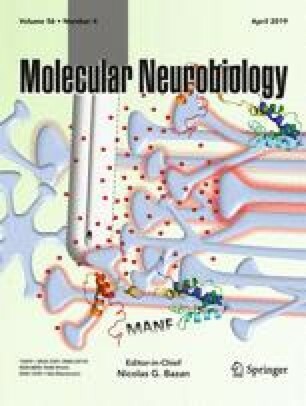 Overexpression of the deiminating cytosolic enzyme peptidyl arginine deiminase 2 in nervous systems results in increased neuronal transport and neurite outgrowth. We further demonstrate that enriching deiminated proteins rescues transport deficiencies both in primary neurons and mouse optic nerve even in the presence of pharmacological transport blockers. We conclude that deimination promotes neuronal outgrowth via enhanced transport and local protein synthesis and represents a new avenue for neuronal regeneration in the adult CNS. The online version of this article ( https://doi.org/10.1007/s12035-018-1262-y) contains supplementary material, which is available to authorized users. We thank A. Trzeciecka for providing part of the neurons. We thank G. Gaidosh for assistance with microscopy. We thank Dr. K. Park for the critical comments on the manuscript. This work was partially supported by an unrestricted grant from Research to Prevent Blindness to the University of Miami, DoD grant W81XWH-16-1-0715, and NIH grants P30 EY014801, EY014957, EY019077, NS034773, and U01EY027257.